These delightful crepes make a great breakfast or dessert. You can roll them fold them or top them with a variety of toppings. I like to double or triple the recipe to make a stack of crepes and serve them with the following combination choices; nutella and bananas; fresh berries with powdered sugar; mixed berry preserves and mascarpone cheese; or just plain old maple syrup. Blend eggs, flour, confectioners sugar, vanilla, salt, orange zest, and milk in a blender until thoroughly mixed and smooth. Bring mixture to room temperature. Heat a 10-inch crepe pan on medium-high heat until hot. Brush pan with melted butter and pour 1/3 cup batter, immediately tilting and rotating skillet to coat bottom. Cook until underside is golden, (about 30-45 seconds) then gently flip with a short spatula and cook 15-30 seconds more. 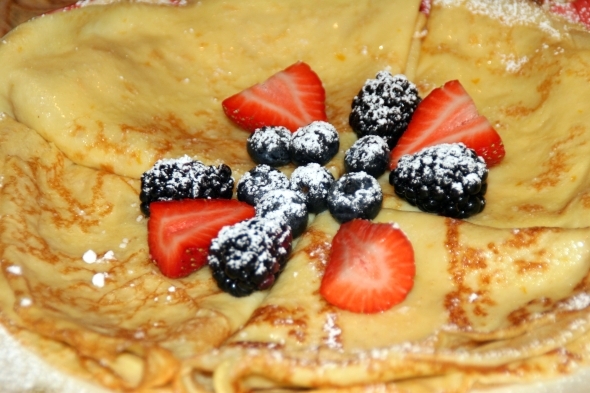 Transfer to a plate and continue making crepes, brushing pan with butter each time. *A smaller pan may be used. If so, use less batter for each crepe. Just enough to coat the pan with a thin layer.